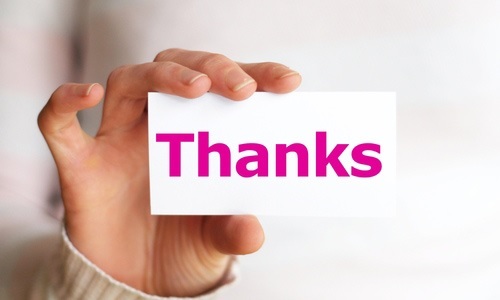 We’ve certainly read enough “what I’m thankful for” messages in the past week, so all of creation hardly needs another. However, since we focus a lot on word choices that advertisers make, if there’s one that gets overlooked and underused, it is this: thanks. That word has the power to praise, motivate and cheer. In a marketing world that so often targets individuality and me-first, all the while leaving fathers out of the message, it’s nice to overuse that simple word as much as you can. Yes, dads especially love hearing it. They repeatedly get ignored by marketers who prefer to speak only to moms, thus making them feel like second-class parents who don’t matter. We believe this week’s annual exhortation to give thanks is overstated. Giving thanks seems like such an internal, individual, private affair done only in our minds, or perhaps just before Thursday’s big meal. But giving thanks is one thing. If nothing else, Lysol is efficient. With one little promotional brochure disguised as “valuable information for baby’s first few weeks,” Lysol manages to both exclude dads outright, and peg moms as the do-it-all types who exclusively handle the household cleaning. If you can get your hands on this curious eight-page booklet, Lysol once again celebrates all things mom and leaves dad in the house dust. Forget the fact that the other baby’s biological parent (by the way, Lysol, that would be dad) had an equal part in conceiving the child, and now has an equal part in nurturing and caring for it. Apparently, dads have nothing to do with “healthing” and keeping the baby safe from germs. That’s up to mom, who does the chores, and in Lysol’s world most likely the cooking, too. And dad? Who knows where he is. Probably sitting on his easy chair watching the news, not to be bothered by anyone, sipping brandy after a long day of work. That’s the way it’s supposed to be, right Lysol? The only way we believed this piece wasn’t unearthed at a flea market having been stuck in between some dusty 1950’s Life magazines was by seeing a website printed on it, proving that this must be some modern day desiring among Lysol executives for a bygone era where moms handle all the cooking and cleaning. Things are different now, Lysol. Dads do indeed exist, and they certainly help out with newborns. How about starting by congratulating them while you’re at it? 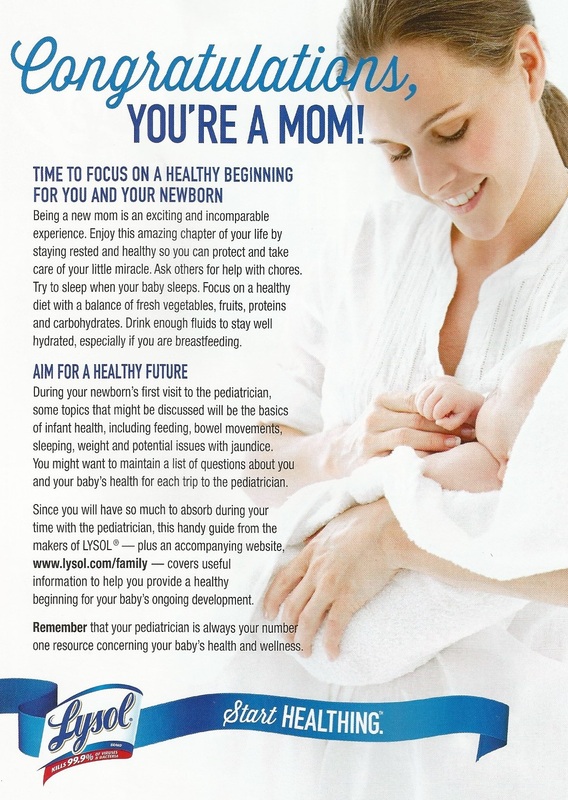 If this was intended to be a mom-only brochure, then this piece is all the more troubling. It makes mom out to be the house cleaner and totally excludes dads from a joyous occasion. Dads have been left out too long, and in too many ways. Things don’t get any better over on their website, where there’s hardly a dad to be found, plus articles that only speak to moms (I guess dads either don’t clean baby toys or don’t have the ability to do so). Really Lysol, how can something so new be so old fashioned? How refreshing is this latest email campaign from Wendy’s? In a world where marketers often perceive moms as the parent-in-charge, here’s an invigorating approach from a company that’s simply giving both parents their rightful due. It was plain and simple, but it got the job done. They don’t overdo it in the other direction with some out of place, one-time deal for dads so often seen only in June. Their website doesn’t look overly frilly or feminine, as baby websites so often do. They did their own way, and did it right – by focusing on family. 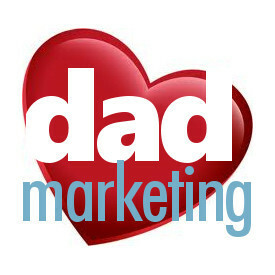 Like so many companies before them whose stories have been revealed right here at dadmarketing, Wendy’s had every opportunity in the world to exclude dads and put moms solely in the spotlight. Rather, they use the words parent and family at every chance they get. While it’s not exactly a shared 50-50 equivalency among photos of moms and dads, we don’t think it’s necessary. Their mission and focus is carefully crafted by a team who stuck to a game plan by highlighting the adoptees, and in turn, present some touching stories with class and dignity that make all parties feel welcome. 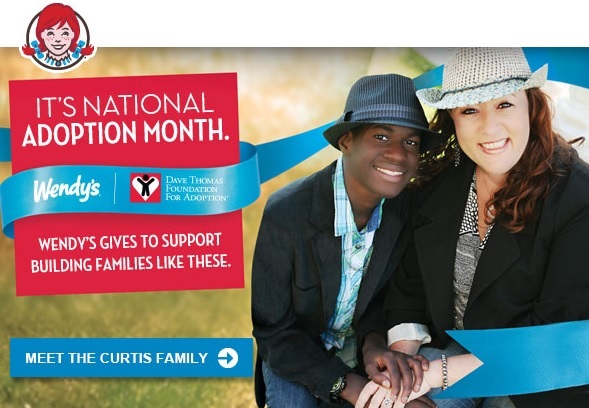 They realize that families come in all shapes and sizes, and they didn’t exclude anyone in the process. It was only one little email, but Wendy’s has dadmarketing’s highest Seal of Approval, and others should take lessons from them. Wendy’s goal here wasn’t about hamburgers or the bottom line, but it all makes perfect business sense. You may have noticed the recent headline about the University of Tennessee athletic department dropping the “Lady” portion of its Volunteers nickname from all sports, except basketball. I vividly remember the first time I was introduced to the word lady and its association with a sports team – at my local high school. Frankly, I couldn’t believe my eyes, and I had questions. Lots of them. Why was a girls team purposely making themselves out to be different than the boys (and as a result, giving them a lesser-than feel) by putting this unnecessary word on their jerseys? At the very least, why couldn’t they be identified as girls, instead of such a formal word like lady, which really has more of an adult connotation? And, treating all things equally, why then, didn’t the boys team use the moniker “gentlemen” on theirs? It was as if the girls team was intentionally signaling everyone in attendance with a madcap scarlet letter and caution label right on their jerseys: no, we’re not the real sports team, we’re just the ladies sports team. If you want to see the official sports teams, you’ll have to watch the main event, the boys. I’m all for recognizing two different genders and giving each their due, but this deliberate separation by way of a simple term left the entire situation feeling so unnecessary, cruel, unfair and demeaning. The Academy Awards doesn’t call it a Lady Oscar for the actress; it’s just an Oscar. We don’t have teachers, and lady teachers. There aren’t parents, and lady parents. All male cats aren’t just cats, with the others being called female cats. Sure, there’s still plenty of absurdity in our world. Seeing a female city council member categorized as a councilman looks as inane as it is literally inaccurate. Yet even other parts of the sports world have been slow to embrace equality. Despite the effects of Title IX, sports has taken a long time to get with the program. For example, why must the men’s NCAA basketball logo be branded “Final Four” while the women’s logo states, “Women’s Final Four”? Shouldn’t the former be called “Men’s Final Four,” making all things uniform? And speaking of uniforms, isn’t that what sports clothing is supposed to do – make things alike, as in unified? 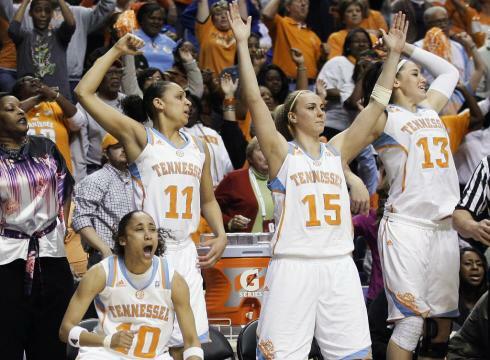 If you let one team wear “Volunteers” on a jersey, and their counterpart wear “Lady Volunteers,” does that really send a message of togetherness and harmony among the entire Tennessee athletic department? And its women’s teams even have their own blue accent color to create a further divide. Talk about a silent, unspoken rebellion. Then you have the NBA. Yes, the NBA came first, but why is the women’s league deemed the WNBA? Shouldn’t the men’s league be rebranded the MNBA, or at least give the women’s league a name with a less secondary feel to it, such as the Liberty Basketball Association, or American Basketball Association? What about the PGA vs. the LPGA? Are not the women golfers of equal stature? The “L” makes it seem like the lesser league that it’s not. When Michelle Wie played on the PGA tour from 2004-2008, did it not seem like the media had promoted her to the main/real/top league? NASCAR doesn’t have a special WNASCAR for female drivers like Danica Patrick. 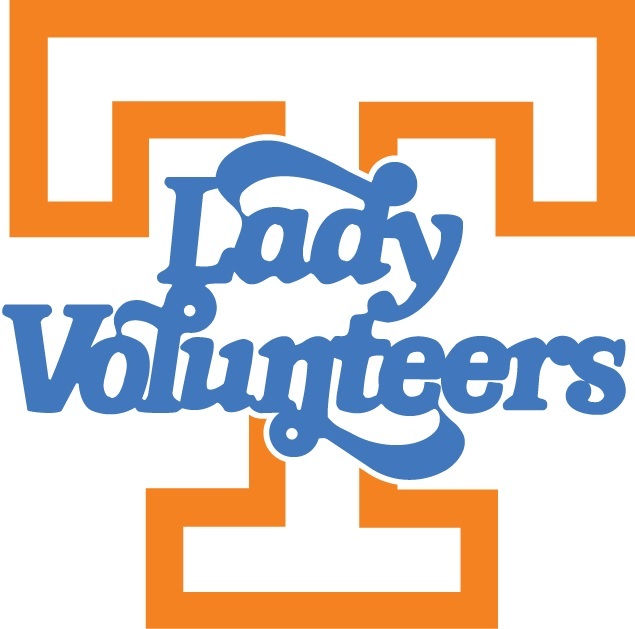 What surprised me the most about Tennessee’s announcement was how some former female athletes felt they were losing their identity with the loss of the word lady. Those athletes might read this post and charge us with political correctness gone too far. But this has nothing to do with political correctness. The term “PC” describes the attitude of being careful not to offend any group of people in society believed to have a disadvantage. One could accurately argue that women have disadvantages in a variety of ways, but using the nickname Lady Vols certainly doesn’t create any advantage; it belittles, demeans and unnecessarily separates. I suspect the athletes, fans and those around Tennessee athletics had become desensitized to a term that was so commonplace and deeply rooted in sports culture at their university. The winning ways of the successful hoops team no doubt made it famous and celebrated. The term had grown and became its own separate brand with no one ever stopping to question how silly it looked in the first place. Can’t see the forest for the trees, kind of comes to mind here. 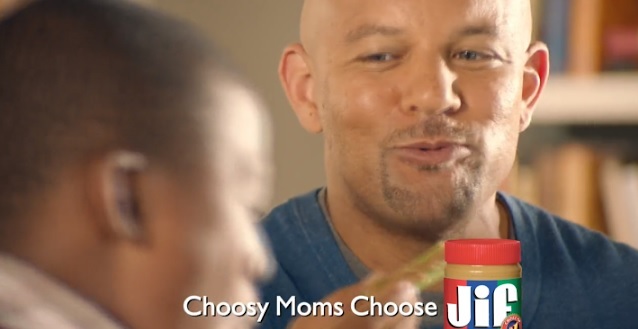 It’s a bit like Jif’s “Choosy Moms Choose Jif” saying, or Kix’s “Kid-Tested, Mother-Approved.” Frankly, I’m surprised more dads aren’t up in arms over them. But both moms and dads have probably become deadened to the phrases. Those old-fashioned sayings have been around for decades and after all, many people enjoy the products anyway, so the slogans go unnoticed, and in the if-it-ain’t-broke-don’t-fix-it vein, most really don’t ask questions. As for my original questions, no one’s really ever been able to succinctly answer them. I doubt anyone associated with Tennessee can either, especially those who strangely want to continue with the Lady Vols nickname for basketball only. But our country was founded on dignity and equality, and dadmarketing will keep searching for it in our corner of the world. We hope the folks at Tennessee do in theirs, too. You’ve seen these kind of ads in the back of magazines before. They’re a collection of magazine advertisers, sort of a classified ads section. What gets me is how Parents magazine wants it both ways. On one hand, they’re trying to appease to moms and dads by giving the magazine the name it has, yet when it comes right down to it, both stories and ads in nearly every issue largely speak only to moms. So is this section for parents, or just moms? Then you have the “Baby Depot Savvy Mom, Happy Baby Sweepstakes.” (The contest title is goofy enough: are dads not savvy, resulting in unhappy babies?) But here’s the real kicker: the contest was open to any legal resident 18 years and older – that means dads were allowed to enter a mom contest! Kind of reminds you of this weirdness, doesn’t it? So, in one fell swoop we have dad exclusion, a contest not fully thought-out, and a marketing blunder that leaves egg on the face of both Parents magazine and Baby Depot. It just goes to show you that it starts at the top. 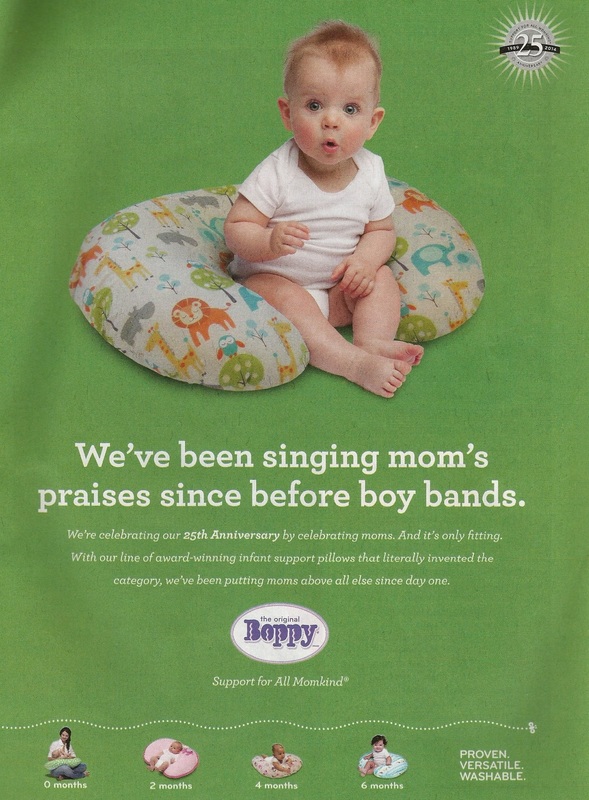 Parents magazine could have talked to the advertiser about their contest gaffe, but without practicing what they preach (as in the magazine’s name), it’s hard to put the blame entirely on Baby Depot. Let’s get back to the basics, Parents magazine. 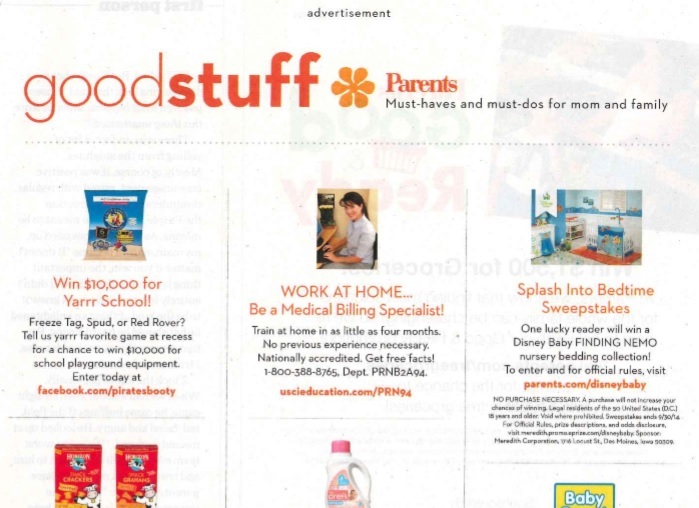 If you’re truly a mag for both mom and dad, start acting like it – and your advertisers will, too.